LT214 hydraulic vibratory roller can be used to compact sandy soil, gravel, rock filling, crushed stone and many other non-cohesive materials as well as slightly cohesive soil. This road roller is applicable to the compacting operation in the construction of high-class highways, mines, dams, airports, harbors, railways, and industrial areas, and so on. 1. This heavy duty vibratory roller can offer large centrifugal force and static linear load. 2. Mechanical drive, hydraulic vibration, double amplitude and hydraulic steering ensure reliable performance and high cost performance ratio. 3. This hydraulic vibratory roller uses reliable D6114 or YC6108 diesel engine which is convenient to operate and maintain. 4. Hand brake and foot pedal brake are both available, thereby ensuring the safety and reliability of the machine. 5. High quality rubber elements are adopted to reduce the vibration of the capacious driving cab, so as to make operator feel more comfortable while driving. 6. The hydraulic vibratory roller features high reliability, easy operation, easy maintenance, and low running cost. 7. It can be equipped with fixed padfood or removable padfoot, if required. LTS214H, LTD214H hydraulic double driver vibratory roller can offer good compacting performance in large-scale mechanized construction. The compaction equipment can compact not only gravel, macadam, macadam-aggregate mixture, sandy soil and other non-cohesive materials, but also cohesive materials. It is widely used in the construction of expressway, mining road, embankment, sea port and industrial sites, etc. 1. We use advanced internationally advanced technology and high quality components and raw materials in the production of our hydraulic vibratory roller. 2. 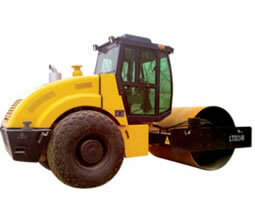 The super heavy duty vibratory roller can offer high working mass and large centrifugal force. 3. It is equipped with Cummins B-series extra-pressure diesel engine with sufficient power reserve. Thus, it can work at an altitude of above 4000 meters. 5. Two ranges of infinitely variable speeds are available. 6. Oil cutoff brake system can ensure the safety and reliability. 7. Streamline shaped outline, circular windshield glass and curve hood makes the hydraulic vibratory roller more attractive. 7. Padfoot drum or removable padfoot are optional. 8. The high quality hydraulic pump and vibrating motor are purchased from American SAUER or German REXROTH. As a professional hydraulic vibratory roller manufacturer in China, we can produce not only road roller, but also combine harvester, forklift truck, rotary drilling rig, pickup truck, etc. Our products are all manufactured in accordance with ISO9001:2008 standard. If you are in need of construction machinery or our other products, please call us.